There are probably few people who can point to an exact moment when their life's direction was decided. These things tend to develop over time, as one's path becomes clearer through circumstances and events. For the Ben Baruchs of Tzfat that path has taken more twists and turns than most. Yet their goals are clear - to create a loving home for as many special needs children as possible in their small Tzfat apartment. Chaya and Yisrael Ben Baruch were married in Fairbanks, Alaska, and the births of three boys quickly followed their marriage. Their third son was born with Downs Syndrome, and soon after his birth, the Ben Baruchs decided that it would be to his benefit to grow with another child who was similar. So while Avichai was still small, they adopted a little girl with Downs Syndrome. Avichai and Keren grew through toddler hood together, and at the same time, the Ben Baruchs were thinking of other changes that they wanted to make in their lives - they wanted to make aliyah (immigrate to Israel). So with their four children in tow, they arrived in Tzfat. 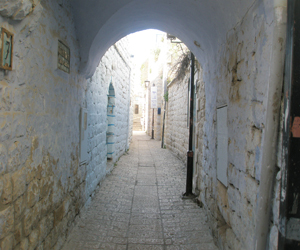 Most Tzfat residents who were in the city 12 years ago remember quite well the sight of the Ben Baruchs, each with a Downs child in a backpack, walking down the street with their two older sons on either side of them. As Avichai and Keren were entering school, and life should have started easing for Chaya and Yisrael, they heard a rumor about an infant with Downs who had been abandoned in the Tzfat hospital after birth. Within a few weeks, the new little girl, Shalhevet, was settled in the Ben Baruch's home, and the local Social Work Department began harassing the Ben Baruchs, insisting that they could not possibly give proper care to three Downs children. As Shalhevet grew and thrived, the social workers went into hibernation, but several years later, the Welfare Department declared all-out war on the Ben Baruchs when they accepted an infant boy, named Ori, with Downs whose family was unable to care for him. At the same time that the Ben Baruchs were battling the Social Work Department, they were fighting for Ori's life - as with most Downs children, he was born with many health problems, and more developed almost daily. While Yisrael and Chaya juggled their young family at home with almost weekly hospital stay-overs, they fought for Ori to stay with them, hiring a lawyer and taking the Social Services of Tzfat to court. Frequent email alerts were sent out to the Tzfat community, asking them to pray, not only for Ori's health, but also for a victory over the social workers who preferred to institutionalize him rather than leave him in the Ben Baruch's loving home. Shortly after Ori's open-heart surgery, when he shared his hospital room with a little girl with Downs who had been abandoned, the court granted the Ben Baruch's foster care of Ori.....and the Ben Baruch's lawyer adopted the girl from the hospital. Last year, an Israeli family asked the Ben Baruchs to take in their Downs baby, and Chaya and Yisrael agreed - little Nechama lived with the Ben Baruchs for seven months before she died from an infection, but not before she touched the hearts of so many people around Safed, as all the children have. Presently, Chaya and Yisrael would like to develop a home where more special needs children could be cared for in a loving, home-like atmosphere. In the meantime, they admit that they don't know what, or who, the future might drop on their doorstep. But they're ready.